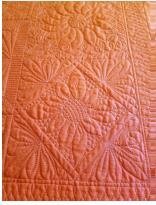 Now that you know how to free-motion quilt with rulers, this class will help you combine the technique with traditional free-motion quilting. While making a small project, such as a table topper, placemats, or table runner, Karen will help you learn basic free-motion designs such as swirls, tear drops, paisleys, pebbles, and leaves. A design workbook is included in the class fee. You much have taken a prior Quilting with Rulers 101 or My Bernina Ruler Class. Requirements: Prior Quilting with Rulers 101 or My Bernina Ruler Class.